184-hour long #BrokenRecordShow kicks off #WWCF2017 at 5am Easter Sunday at Third Coast Comedy Club and runs non-stop 24-hours-a-day through Sunday April 23, 2017 at 9:26pm. Beginning at 5am on Sunday, April 16th, 2017, Nashville StandUp will attempt to set a new GUINNESS WORLD RECORDS™ title for “LONGEST COMEDY VARIETY SHOW” at Third Coast Comedy Club in Nashville, TN as part of the Wild West Comedy Festival. Nashville Standup is the current record holder for “LONGEST STANDUP COMEDY SHOW – MULTIPLE COMEDIANS” – a record it has topped twice. The non-stop, 24-hours-a-day, 8+ day schedule will feature showcases, feature-length, and headliner-length sets, and will include surprise drop-ins from comedians of various levels of fame and fortune (and infamy and misfortune) PLUS sketch and improv comedy group performances! The show is co-produced by Nashville-based comedians DJ Buckley, Chad Riden and Mary Jay Berger. From April 12-20, 2015, NashvilleStandUp.com produced the first World Record setting #BrokenRecordShow in Nashville, Tennessee – a non-stop 184 hour, 16 minute long standup comedy show that more than doubled the previous GUINNESS WORLD RECORDS title of “Longest Stand-Up Comedy Show – Multiple Comedians.” The show featured about 100 comedians, including surprise celebrity guest sets from Hannibal Buress, Eric Andre, Rory Scovel, Nate Bargatze, Luis J. Gomez, Keith Alberstadt, Jon Reep, Ahmed Ahmed and Killer Beaz. While conquering the “Longest Stand-Up Comedy Show – Multiple Comedians” record twice, the producers were constrained by very specific rules about what could be allowed on stage during the show. For #BrokenRecordShow vol.3, in order to compliment Third Coast Comedy Club’s mission to empower local artists to produce every form of comedy (stand-up, sketch, improv, comedic plays, variety shows, live podcasts, and talk shows), #BrokenRecordShow producers decided to try something new – setting a record for “LONGEST COMEDY VARIETY SHOW” including stand-up, sketch and improv acts. It’s The Greatest Dumbest Thing We’ve Ever Done Again.. And Again. #BrokenRecordShow vol.3 begins at 5am on Easter Sunday, April 16th, 2017 and continues through 9:26pm Sunday, April 23rd (senselessly beating #BrokenRecordShow’s “LONGEST STAND-UP COMEDY SHOW – MULTIPLE COMEDIANS” record’s run time by five minutes) for a total of 184 hours and 26 minutes. GUINNESS rules dictate that there must be at least 10 audience members at all times. No matter what time of day or night, somebody will be on stage telling jokes, so go hang out. “DAY DRINKER” passes are available for just $5 from 5am – 5pm every day. 24-HOUR PASSES are $10 and ALL ACCESS and VIP options are also available which allow patrons to come and go as they please throughout the entire festival. 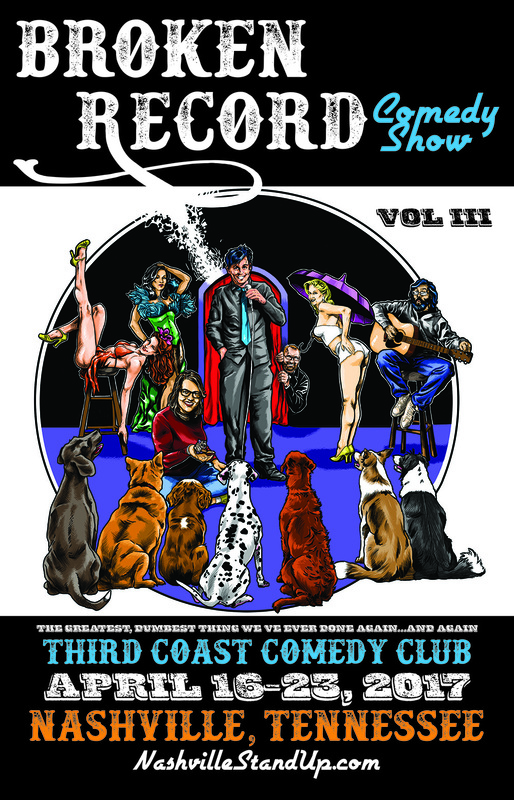 Tickets are available at Third Coast Comedy Club and online.